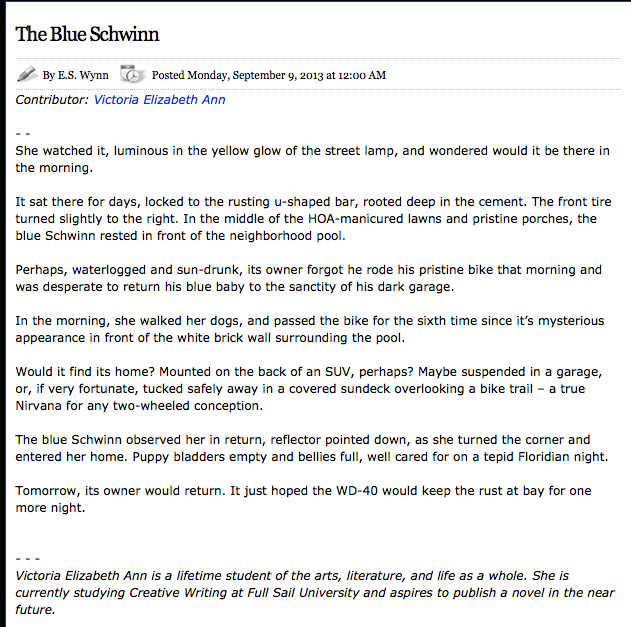 In all of the rush and bustle of these last few weeks of school, I had absolutely forgotten that my flash fiction, “The Blue Schwinn,” was due for its second publication today in Linguistic Erosion! Well, that’s a pleasant surprise to wake up to! Thank goodness I had set a reminder in my calendar – I would have completely overlooked it otherwise. Flash fiction: short, sweet, and to the point. Writing for today’s ADD generation. There’s a ton of really unique, imaginative flash fiction available on there and I think you’ll be surprised by some of the topics. I can easily lose an hour or two just browsing through the site. Several classmates from Full Sail University have been published there, as well, so I can definitely vouch for some good quality writing on there!